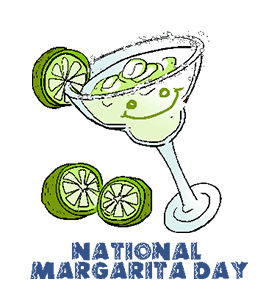 ﻿National Margarita Day: Calendar, History, Tweets, Facts, Quotes & Activities. National Margarita Day focuses on appreciating the margarita, a tequila-based alcoholic cocktail. The origins of National Margarita Day are not well documented, although accounts of the day begin to emerge in the 1990s. A margarita is cocktail made of tequila, triple sec and either lime or lemon juice served in a cocktail glass with salt on the rim. Like the origin of the holiday, the origin of margarita is unclear as numerous bar tenders worldwide have laid claim on the drink's creation. Several bartenders and restaurant owners in Mexico allege to have created the drink for a female friend with a name similar to Margarita. Given that the cocktail contains tequila, the drink may have originated somewhere in Mexico. In fact, the tequila used in margaritas is made from blue agave plants that grow in Los Altos, Mexico. This holiday is observed every year on February 22nd. The true origins of the margarita drink are unknown. Some stories say it was invented in Mexico, others in Texas. The record for the largest margarita is held by Margaritaville, USA. With a volume of 32,176 liters, the margarita took 300 hours and 60 people to prepare. Margarita placed 6th in Drink International's ranking "The World's Best-Selling Classic Cocktails 2018". Margarita means daisy flower in Spanish. Visit your local tavern, bar or restaurant on National Margarita Day. Most will offer discounts and specials to celebrate National Margarita Day. Make Margaritas! The most popular variations according web search traffic in descending order are: strawberry margarita, skinny margarita, patron margarita, mango margarita. Go on a tequila distillery tour to learn more about the art of making tequila. One popular destination is the Mexican State of Jalisco from which Tequila originated.